Wow, these macarons look so cool, or should I say hot ;) I looove the sparkling sugar on them. i have *got* to learn how to make macarons. i will learn by the end of february, oh yes i will. or, you know, not. i guess that's what my "failures" category is for. but i will give it the old college try! Congrats, Helen! That's really something to be proud of! Spicy! They look so pink...which is my favorite color. Congrats on the Dessert magazine, they are using something of mine in one the issues. Une fois de plus, superbes les macarons. 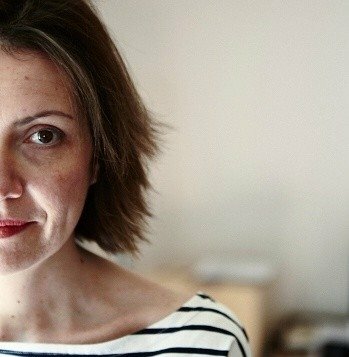 Hi Love your blog so much have worked my way back to its start! Very impressed with your very professional looking macaroons...as good as Laduree's by the look of them! These look gorgeous and congrats on making the cover. You deserve it. I'm sorry that you didn't win the Napa trip, I know that you so badly wanted to go. But congrats on making it to the cover of Dessert Magazine!! i'm a huge fan of your blog--and your recipes always look both tasty and visually delightful as well. The hot tamale macarons are absolutely precious! Wow... that's so exciting! Congratulations! You really did have a beautiful looking dessert there. As for the Hot Tamales... I don't know what they taste like, I've never eaten one, but these look so fun and colorful! Finally, you posted them. They do look like jewels! Congrats on your magazine cover... so cool! 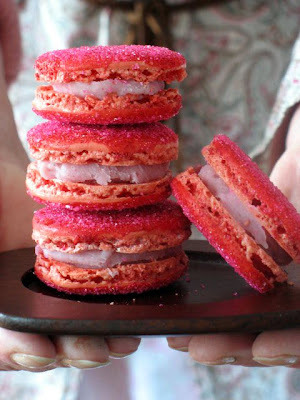 What a crazy fun idea - Hot Tamale Macaroons! I love hot tamales but I don't think I have ever eaten a macaroon. Congrats on the cover of the dessert magazine, I am clicking there next! That's just fabulous Helen! I'm so happy for you. Congratulations! Like these macarons...they really look like they belong in a jewelry shop window :) Gorgeous! Congrats on the cover, Helene! Definitely well-deserved, that picture is a killer, and I´m sure the recipe itself is delicious. These are really cool. Superb creativity!!!! Congratulations! I am making a point not to show these macarons to Quinn, because he'll have me making them immediately. Congrats on the magazine and as usual, you amaze me with your macaron talents! Those macaroons sure look hot! 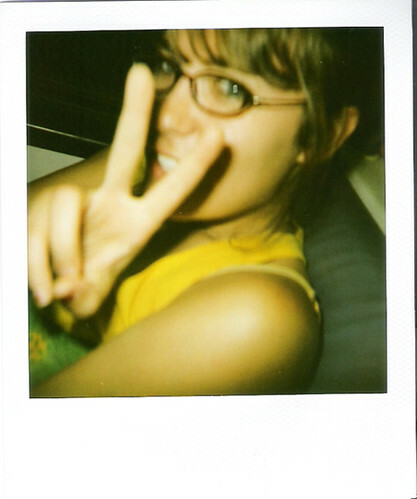 i've been checking out your blog for a while now and i must say. it has a real down home - down to earth feel. i really like that! you've inspired me to start my own blog. let me know what you think about it please! i'm must a newbie! Oh please Helen, NEVER stop. 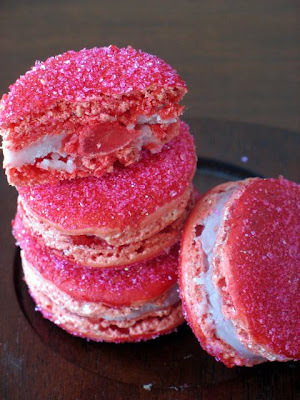 Write all the lovey that you like because I certainly love each one of these posts AND I love the Hot Tamale Macarons!! Knowing how you feel about your guy makes me feel better about all the world. WOW how cool is that - on the cover no less! I'm off to check it out!! I've felt the same 'oh-my-god-not-valentine's-day-again' feeling when reading food blogs. have people gone nuts? :D it's not celebrated as much here in Estonia and although I made candies for my friends and stuff and had a great day and stuff, that holiday is NOT about making all my food heart-shaped. Riiight? These look absolutely amazing - the colours are perfect! And you go ahead and toot your horn - it's just great to see your photo on that cover. Congrats Sweetie making the cover and the "red hot macarons" look spectacular. Helen, what would I do without your baking and food-photography inspiration??!??! 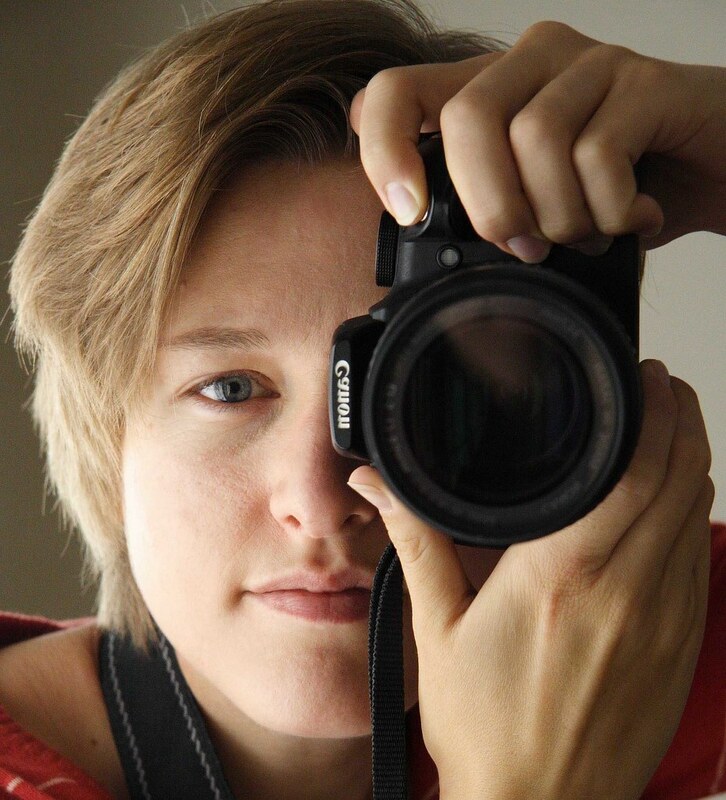 Visiting your blog each and everyday (yes, I do, haha) is such a treat!! I keep coming back to look at these....they truly are a work of art. Your macarons are so playful and pretty, Helen. I love them!! Also, huge congrats on your cover photo and feature in Desserts Magazine!!! These are the cutest little sweets I have seen! Loving the color. Congrats on being featured in the magazine. You deserve it with all your beautiful treats. The macarons look fantastic and HOT, but Whoooo-hooo for the cover of the Dessert magazine AND being the first recipes inside. They did a nice job and it is fun to hear the sound of pages turning as you move to the next page online. Very cool! Congrats. your macarons look fantastic! I like how you have a secret surprise sandwiched inside and then you gilded the lily with sanding sugar too! 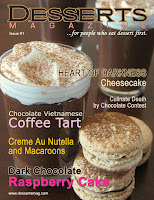 OMGosh, exciting to have your delectables on a magazine cover! Can't say I'm surprised...your pictures are practically edible and your writings about the food is equally tasty! Congrats! Congrats on the cover--you deserve it! I just made your recipe for creme au nutella for the first time this weekend and thought I had died and gone to heaven (http://lafujimama.blogspot.com/2008/02/attack.html). Thanks! Gorgeous! I love it! Great news on the magazine too.. congrats! Congrats on the cover! Way to go...great photo! The macaroons look beautiful! Woo hoo! Congrats on making the cover of a magazine! Your macarons are so fun. How can you top pink, sparkly, with a hidden candy in the center? Fabulous! I am constantly impressed by you!! Macarons look fantastic, my red-hot loving friend will appreciate these on her birthday! thanks for the wonderful round up. congrats on the cover!! those hot tamale macaroons sound great. i love hot tamales!! target sells a big ol' box for something like 99 cents! can't compare to these i'm sure! your macaroons looks so sparkly and beautiful! congrats on the cover, that is so cool! No one deserves it more Tarty! Now those have to be the cutest macarons I've seen! Love the sparkly sugar! Congrats on the cover! WOOO!! Holy cow! That is fantastic! Congrats!!! Valentine macarons after all! They look so special with the sparkles on. And congrats also on being a 'cover girl'. Helene, do you know that you are absolutely amazing?! Congrats on the cover of the magazine (I'd put you on the cover of every magazine - even Popular Mechanics - hee hee)! But those macarons, you have outdone yourself. They are so pretty and creative and a labor of love. Cheers to you and your very lucky guy :) And I just want to say that I adore your mom, what a sweetheart she is! Wow--these are gorgeous and inspiring. Thank you. Would love to give them a shot at home! Wow, those are beautiful. I can't believe that people make macarons. I think of them as a purchased item. :-) Very beautiful!